The Smith Creek Preserve is about 1300 acres of classic Ozark scenery just a few miles south of Boxley Ark. It’s owned by The Nature Conservancy – a terrific organization, is bordered on the south by the Ozark National Forest and the west by the Buffalo National River, and is open to foot traffic only. This was my first visit and I was eager to see some new scenery. As the name suggests, the central feature is Smith Creek and the entire property is a rather steep-sided valley where the creek loses almost 400 feet of elevation in its 2-mile northerly journey. That means lots of little waterfalls and cascades, moss-covered boulders – some bigger than my house – strewn about, and sheer cliffs. Near the north boundary is 21′ Elise Falls on a small side creek. It was dry this time and due to its small watershed, I suspect it doesn’t flow for long after a rain. Near the south boundary is a pretty good-sized spring. The property is above Sherfield Cave, where the state’s largest colony of Indiana bats spends the winter. Indeed, the area is pockmarked with sinkholes where part of the creek apparently flows down into the cave. The parking area is at 35.9344, -93.3858. There are several trails (get a map here) and hiking them all is about 7 miles with some repetition. A suggested route of about 5.25 miles is to hike south to the Big Spring, then back north to the picnic area and continue north on the Lower Trail to the lower crossing of Smith Creek, a side trip over to the falls, then up the hill to the trail head. Be prepared to get your feet wet. I was headed south through Ponca on my way to the trail head and mused that if only I was there in the morning or evening, I might see some elk. Just a short distance south of Ponca, there they were – at about noon – laying around in a pasture on the east side of AR-43. Maybe it’s time to reintroduce wolves to make elk life more exciting? 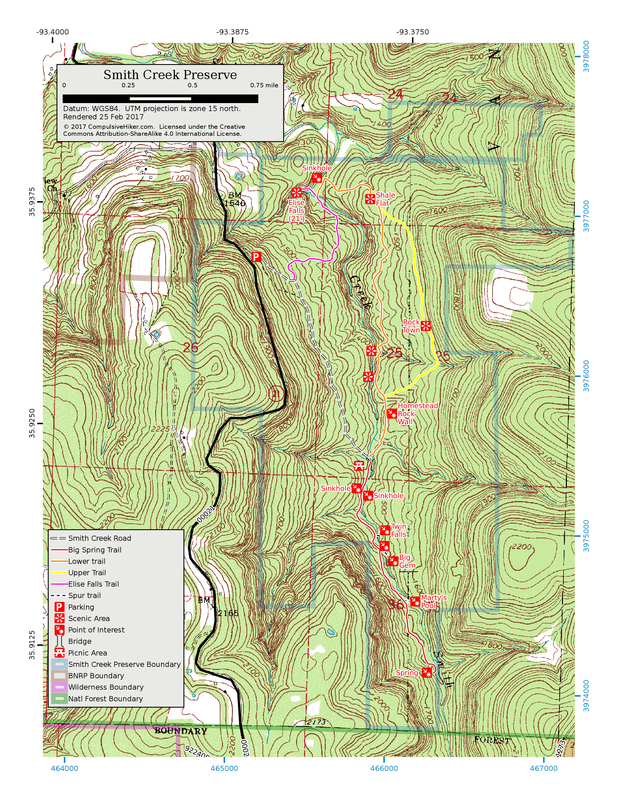 This entry was posted in Uncategorized and tagged Buffalo River Area, Hiking. Bookmark the permalink.